Elk habits always revolve around security (cover), food and water. Elk don’t just find a spot that includes all three and then stay there. They move around widely and most often spend night times feeding in varying areas that hold the most bang-for-the-buck grazing opportunities. Secure cover is not so important at night. Water may still play a vital part, especially in warm weather. The nighttime priority order may be food, water and then, nearby cover. Come morning they will travel again, as far as they need to in order to feel safe in heavier cover during the day. Daytime elk habits will also include the three requirements of cover, food and water. In the early fall, during archery season, separate smaller herds (harems) often meet together at local nighttime feeding areas. At these communal feeding grounds (often ranchers’ hay fields or big meadows) they will feed most of the night as one big herd, though herd bulls will try to keep their female prospects separate from other bulls’. During the rut, the bulls will also feed heavily at night, but competition for all those cows in one place is one hectic competitive circus! The bulls don’t get to eat nearly as well as the cows during this busy rutting season. The cows are building up fat stores to help produce healthy calves. 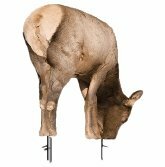 The bulls’ God-given single-minded goal in the fall is to sire the genetically strongest calves (whether they know it, or not). They will come out leaner for all the running around they have to do during the rut, ill prepared for winter. A nighttime feeding group may be as many as a few dozen to over a hundred. Once dawn’s early light begins to appear they will all begin moving away from this major local feeding area together, often walking in a single line behind an older cow (a key player in establishing elk movement). The big herd will begin to separate into smaller and smaller groups as they head toward the trees or brush, with different bedding areas on their internal maps. Once in the trees, they will again completely separate into smaller harems controlled by dominant bulls. Many a hunter who sees this mass morning exit excitedly sets up plans for an ambush on the edge of the trees at daybreak. It’s a much tougher set up to pull off than what it appears to be. The elk are at a heightened sense of awareness out in the open in encroaching daylight. They often walk fast in the open daylight. They might enter the trees a few hundred yards from your best guess. Good luck changing your location fast enough to get their first! They slow down some, once they get inside the trees. Setting up an ambush back farther, where you can’t see the elk, means you don’t know if you’re in the right spot or not, unless they are bugling. If they have been pressured, they may not bugle until they are inside the cover of some trees. Plan B would be to sneak up alongside of them while they are eating and moving in the trees. It can be done with good still-hunting and stalking skills. Bugling bulls might help to keep you going in the right direction. But remember that the cows aren’t standing next to the noisy bull. They will bust you in the blink of an eye if they see or smell you first. During the early pre-rut period (early September) the elk are fairly relaxed and use these open green areas to feed at night. Even the big bulls will often be with them. However, be advised that the bulls will immediately avoid this potentially lethal habit of walking into and out of thse areas in the daylight, once they sense that they are being hunted. Waiting for them at the edge of the woods might be exciting, but counter productive. Carefully consider your approach to this type of set up to avoid detection. Always respect the wind and elk noses. Approach the area you plan to set up in from the opposite direction from their approach to avoid leaving your scent as evidence of the set up. Use careful scent control measures . These bulls may be traveling in bachelor groups at this time and have well established patterns from feed to bedding each day. Mess it up and you start from scratch, as they become nocturnal. Before you start hunting these open green feeding areas, spend some evening time glassing it from a distance to see what the pattern is. (This is a good plan for all evening feeding areas.) Plan your morning hunt from there, along with topographical and aerial maps of the area. This all happened after most thought the rut had peaked! Other hunters related similar resurgence of noisy rut activity that day in other areas. “It seems like someone just hit a switch that day”, one related to me. I agreed. I mention this to simply show the variability of elk patterns. Nothing is set in stone and everything changes. The next day the herds were neatly separated into smaller harems as had been the norm prior to that unexpected circumstance the day before. Elk have many patterns to choose from. It’s hard to tell when they will choose which pattern and when they will change it altogether. Below is a map that is an actual (approximate) observed elk movement route during the early weeks of archery season. Observation involved hearing bugling bulls coming together from various forested areas, watching a couple of smaller groups come together late afternoon at the edge of the trees, then early the next morning viewing of the feeding herd leaving hay fields toward cover, then following a harem by bugle sounds and sightings all the way back to a bedding area. As you can see, the harem observed in the morning followed a route that took them on a trek over 3 ½ miles one way. Of course, they each actually walked much farther while meandering back and forth through this elk habitat, but it gives you an idea of why it’s so hard sometimes to pattern elk habits. The food they eat while sitting fairly tight in thick cover will be very different from the night time all-you-can-eat buffet and the walking snacks along the way back to cover. Thickly growing grasses are probably the main course on the menu at night. They will take “breaks” from munching to lie down and belch back up some food, to chew their cuds for further processing. In order to convert their high fiber diet into high quality protein, the roughage they eat must be digested very thoroughly, hence the repeated chewing and progressive four stomach compartments that ruminants are equipped with. On the way back to daytime cover, their route will meander through opportunistic smaller plots of woody browse, grasses and forbs. If possible, they will purposely wind through nutrient dense areas like aspen groves and clover, which grow together in wet areas. They might delay a while in these rich areas as long as nothing pressures them to move on to the greater security of thicker cover. If this kind of location can be discovered by observing local elk habits, the hunter may be able to set up a good ambush site. If bulls are willing to leave their cows, or satellite bulls are anxious for a wild card mate, a hunter might be able to call one up close to him. Avoid the bugle. Break out the cow call. Once the rut is over, silence leaves you feeling all alone with less hope of knowing how to find them, unless snow is on the ground for tracking. Knowing potential elk habits and movement patterns will help you to eventually get lined up for a shot. Later in the season, bull elk habits are to begin to travel alone or in small bachelor bull groups at higher elevations. The larger bulls will find small, rich patches of high altitude plots of food, water and cover. Some of the younger bulls will still feed and move around with groups of cows. Later in the fall, when the lower elevation large meadows and hay fields are dried up and brown after a few heavy frosts, preferred night time feeding areas will be smaller and attract smaller groups of elk. Elk habits begin to morph into a different shape with the changing season. In a given elk habitat area, there are several options for bedding, travel routes and nighttime feeding. For a time they might follow the same patterns, but are internally wired to vary their patterns in order to avoid over-feeding an area and stripping it of food. They will also change a habit or pattern in order to avoid human or other stress factors. 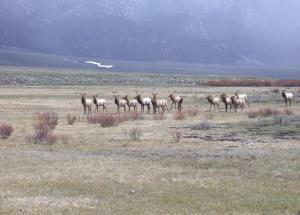 Changing seasons and weather will also necessitate a change of patterns in elk habits. If needed, they will simply move on to a distant location that contains sustainable elk habitat beyond distant ridge tops. 2)	Night time areas of an open, rich food source like hay fields, large or small meadows, etc. 3)	Travel zones with some sparse trees or brush for cover between nighttime feeding and bedding areas. Small, but rich food plots along the way for snacking while walking. To increase the chances of finding elk at any particular time of day within a given area, take copious notes of observed elk habits. 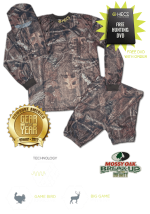 Locate combinations of water sources, vegetation and thick cover on topographical maps and aerial photos of where you plan to hunt. Take particular note of saddles (low crossing areas over ridges) and funnels (thin areas of cover or low effort travel routes) between heavy cover, water, and feeding areas. Spend time scouting on the ground. Put in time and effort watching and studying elk habits and patterns, including fresh elk sign each year. Take good notes and compare them each hunting season to add to your big picture of that particular elk habitat that you hunt. Look carefully for patterns. Elk habits may not seem obvious at first. Time and chance will always play a part in hunting success. Time is on your side, as long as plenty of it is spent in good elk habitat and your knowledge of the local elk habits draws a more predictable picture. Please subscribe to or our Quick Elk Hunting Tips and Updates newsletter or to anRSS feed (see left column for both) to be alerted whenever new information is added to the site.